Peritoma serrulata (Pursh ) DC. Stems: Erect, branched, glabrous, waxy. Leaves: Alternate, palmately 3-foliolate; leaflets narrowly lanceolate, 1 to 2.5 inches long, 1/5 to 3/5 inch wide; margins entire; tips pointed. Inflorescences: Racemes, dense, elongated, many-flowered; bracts narrow, simple. Flowers: On stalks 3/5 to 4/5 inch long; sepals 4, united for 1/2 - 2/3 their length; petals 4, egg-shaped to spoon-shaped, 1/3 to 1/2 inch long, bright pink to purplish, rarely white, short-clawed; stamens 6, of equal length, 1/2 to 4/5 inch long; pistil 1. Fruits: Capsules, 2-valved, linear-cylindric to spindle-shaped, elongate, much longer than wide, 1 to 3 inches long, 1/6 to 1/3 inch wide, drooping or bent downward; stalks 1/2 to 1 inch long; seeds several to many, egg-shaped, black-brownish mottled. Habitat: Prairies and open woodlands, especially disturbed sites or wash areas. Distribution: In all but southeast 1/4 of Kansas. 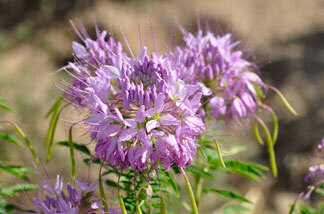 Uses: Rocky Mountain bee plant was an important food source for Native Americans in the Southwest. The leaves were boiled and used for greens (like spinach) and cooked in meat stews with wild onions and celery. The seeds were cooked, dried and used in mush and were also used to make bread. Native Americans also used the plant medicinally. They would take a tea made from the plant for fevers and stomach disorders and use a poultice of crushed leaves soaked in water to treat sore eyes. They also steeped the leaves and used the liquid as a body and shoe deodorant. A black paint made from the plant was used to decorate pottery.